Mix all ingredients together in a spray bottle. You can use this on everything but glass. Spray it on, scrub and rinse off with a clean, damp cloth. If you are always doing something for others, like a servant or a nurse, and never anything for yourself, you cannot do others any good. You make them physically more comfortable. But you cannot affect them spiritually in any way at all. For to teach, encourage, cheer up, console, amuse, stimulate, or advise a husband or children or friends, you have to be something yourself. And how to be something yourself? Only by working hard and with gumption at something you love and care for and think is important. 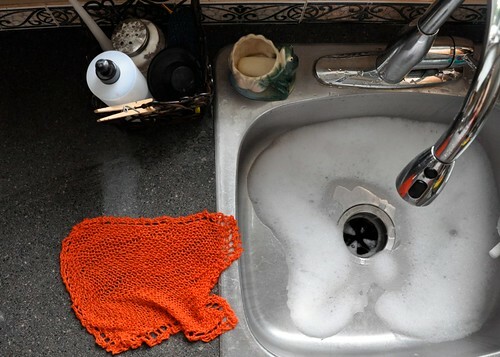 Two questions wrung from a dishcloth pattern: Is there a part of you that is collecting dust? What are you going to do about it? The poem was adapted by Cambridge School of Art student Monika Umba. Makes me want to say Zipity do da. Around here, it’s toss-up which needs more work: the house or the garden. Regardless, odds are I’m reading a book instead of doing what needs to be done. I keep returning to this post. You’ve touched on several things that have me thinking, and I am so taken with Monika Umba’s animation. Thank you, Rachael. I shall return.